If art is about the fostering and maintenance of traditions, then the Russians were proposing a kind of anti-art. 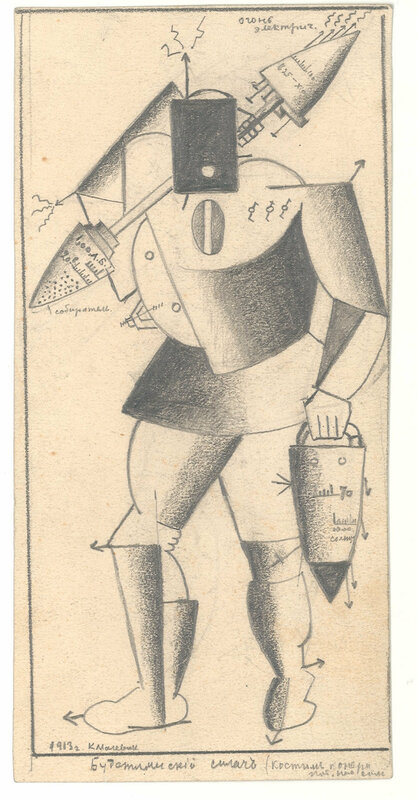 An exploration of the exhibition catalog, Russian Dada 1914-1924. One of the joys and pitfalls of modernism was its self-conscious assessment of the accepted traditions and norms of its social activities and its utter faith that those traditions could be uprooted and reshaped to suit bold new visions of future endeavor. Of course, those visions were often in conflict—hence, the two world wars on the one hand and the proliferation of "isms" in art, on the other. This infatuation with upheaval (as Karl Marx once put it, the awareness that "all that is solid melts into air") invited a posture of negation. Whatever had been must have been wrong and should be remade in the modernist image. This conviction received its clearest formulation in the highly ramified modernist approaches to art at the beginning of the 20th century. Art had long invited philosophical reflection. Aristotle's Poetics espouses a view of poetry (and by implication, all the arts) predicated upon a theory of mimesis—a tricky term that is easily misunderstood when blithely translated, as it so often is, as "imitation", Mimesis is not merely the imitation in, say, poetry of the heroic deeds of Achilles (in Homer's Illiad) through description; it is an attempt to reach the interiority of those deeds, to provide a cartography of the movements of soul that give rise to emotion and act. Mimesis is the assimilation of the other (here Achilles) by the subject (here the reader) through a conductive medium (here poetry). Aristotle, in stark contrast to Plato, evaluates mimesis positively as the boon poetry provides its readers and auditors (as opposed to being the article of deception Plato thought it to be). The point here is that Aristotle provides a theory of how art operates. Similar approaches to art were the backbone of the rise of Aesthetics in the mid-18th century. In all of these cases, the writers attempt to explain how art operates as an already-established (and often perceived as entirely "natural") tradition. At the turn of the 20thcentury, artists and writers began to see their role not as the furtherance of a tradition but as the instigator of a break with it. Examples abound, of course, and the early 20th century witnessed an ever-burgeoning irruption of new approaches to art, many of which were borne along by their own fully-formed and utterly self-conscious theories concerning artistic production. A particularly marked instance of this was Italian Futurism, with its insistence that art ought not simply to confront the traditions of the past but rather annihilate them. Futurism promoted an art of modernity, of the radical new, of an obsessive concern with the increasing speed of movement within the present, the aesthetic possibilities inherent in the exigencies of technology (including the machines of war), and the liberatory potential of the destruction of the past. Futurism's self-appointed spokesperson, the poet Filippo Tommaso Marinetti, called for the razing of museums and their contents; the radically new requires the disintegration of the old. But as the Russian artist Ilia Zdanevich noted in an epistolary charge against Marinetti (reproduced in the new exhibition catalogue Russian Dada, 1914-1924 from the Museo Nacional Centro de Arte Reina Sofía in Madrid and published by MIT Press), under the latter's guidance Futurism had simply become a new orthodoxy, a new tradition that sought its own bid for lasting relevance, its own transformation into venerated historicity. By pretending to be the answer to the conundrum of innovation (that is, how to create the new in the face of the burden of the past), Futurism had become "destructive to art" and "a surrender in the name of academicism" (263). But in a separate essay, entitled "Natalia Goncharova and Everythingism", Zdanevich assured his readers that no special concern need trouble artists regarding the past. "Art is based primarily on aesthetic emotion, which changes along with the evolution of its bearer" (259). In the relatively stable eras (what Zdanevich describes as "hidebound environments") of the past, innovation moved within the constraints of tradition, making new masters readily accepted by the art world and lessening the need to theorize regarding art—stability enabled creation without having to redefine the parameters of art. But that was no longer possible. The pace of life and its attendant emotional and intellectual changes necessitated a radical fragmentation in the realm of artistic creation, a splintering of approaches to expression, an erosion of a homogenous understanding of how art ought to go that gives way to a thriving heterogeneity that requires buttressing through theoretical support. Art can no longer simply perform within the space established by tradition, it must think its way into a thorough-going reconception of space and time. Historical perspective disappears; therefore, the Futurist insistence on waging war with the past is "absurd because there is no past" and to "aspire to the future is absurd because there is no future… time and place are human material created for better construction, and the master can use this material any way he pleases" (260). Zdanevich terms his approach "Everythingism" while other Russian artists worked under the banner of "Nothingism" and, of course, soon Kazimir Malevich would promote "Suprematism". In all cases, the concern was not simply to provide the next ism in an ever-increasing string of isms but rather to find a position that transcends and makes pointless the very notion of a school of artistic production. All three of these isms were meant to be beyond the purview of an ism, they are meant to be meta-isms, if you will. They are self-conscious examinations of the very foundations of what it means to participate in the aesthetic, what it means to produce artwork; they are critical explorations of the ontological requirements that allow us to call something art, and ultimately, they are attempts to destabilize that ontology. 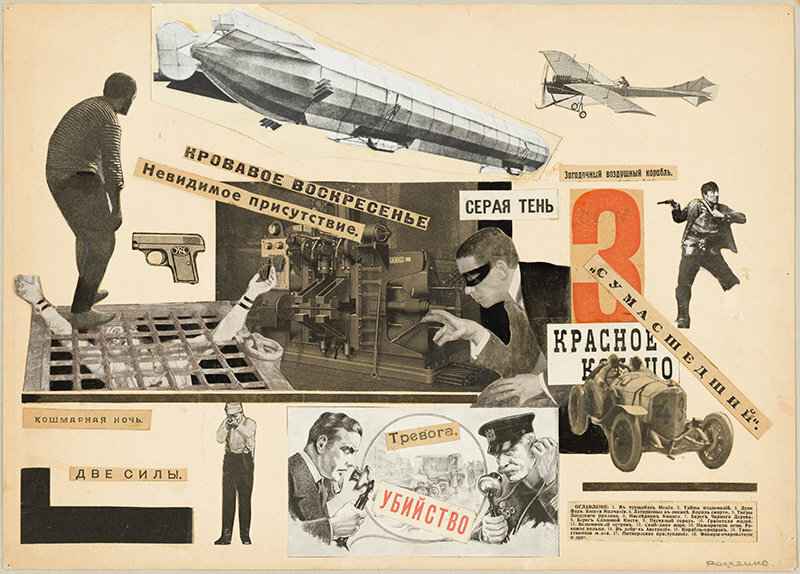 If art has always been about the fostering and maintenance of traditions (even local traditions, and even traditions—like Futurism—that attempted to, at least rhetorically, eradicate all other traditions), then the Russians were proposing a kind of anti-art; a negation of the category of art, traditionally understood, in order to transmute the aesthetic into a new way of thinking one's place in the world, a new manner of production, a new form of action. This, as the authors of Russian Dada demonstrate in their four individual essays on the topic, aligns Russian aesthetic innovations with the emerging international art movement known as Dada. The familiar narrative concerning the origins of Dada around 1915 emphasizes two centers of the movement: the Cabaret Voltaire in Zürich and New York City; a third center, Paris, emerges in the '20s and witnesses the dispersal of the elements constituting Dada. Dada presented an open challenge to the art world and to the rational foundations upon which humanity formed its image of itself. The artists associated with Dada—including such luminaries as Marcel Duchamp, Tristan Tzara, Hugo Ball, Francis Picabia, Sophie Taeuber-Arp, Jean Arp, Hannah Höch, Raoul Hausmann, Man Ray, and Max Ernst—emphasized the disorienting joys of non-sense, the corrosion of aesthetic meaning (or better, the willingness to see the aesthetic as its own manner of meaning so that the question "What does it mean?" is answered by the mere fact of the object's existence), the liberatory potential of transgressing rationality, the irreverent attitude toward the traditional (embracing and rejecting it simultaneously), and a general protest against (or at least disaffection regarding) the war. Of course, the story quickly becomes more complicated. Other centers emerge—Cologne, Berlin, Yugoslavia, the Netherlands, Mantua (briefly), and even Japan—some more politically motivated, some less so. Russia, however, is often left out of account. In his essential examination of the movement, Hans Richter declares: "Curiously enough, Dada tendencies seem to have made their first appearance in Russia" [Dada: Art and Anti-Art, translated by David Britt (NY: Thames and Hudson), 198]. Yet he provides precious little information concerning this "first appearance", marks it as curious, and mentions it in mere passing toward the end of his monograph. Part of the reason for such dismissal seems to be a somewhat prejudiced view of Russia's standing within (or rather outside of) modernity at the turn of the 20th century. Whereas for Zürich or New York the rejection of rationality and the celebration of the seemingly primitive was received as ironic, an intentional thwarting of the usual channels of making sense, a negation of the past that demonstrated a sly sophistication, the art world already viewed Russia as something of a backwater. Their experiments in the avant-garde are often seen as an extension of Futurism (which Marinetti claimed they did not understand). Moreover, since the decade from 1914 to 1924 covers the period stretching from WWI and the Russian Revolution to the death of Vladimir Lenin, the various Russian approaches to art production were often seen as too closely tied to the political upheaval of that country to count as a form of anti-art. 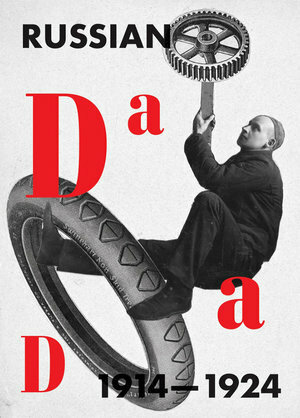 Russian Dada seeks to redress that oversight. Consisting of four essays by four different art critics, numerous illustrations of the artwork discussed, and an appendix with excerpts from the writing of the artists themselves, this book examines the under-told history of Russian attempts to reconfigure the notion of the aesthetic. The book's editor, Margarita Tupitsyn, begins her account of Russian Dada, "Putting Russia on the Dada Map", by recounting Zdanevich's 18 January 1912 lecture at the Troitsky Theater, his first public lecture, in which he declared a pair of mass-produced shoes to have more artistic value then the (at that time, stolen and missing) Mona Lisa. She goes on to recount a rather elaborate (but not always so clearly narrated) tale of Russian artistic achievement in the early part of the 20th century. Tupitsyn depicts these years as a heady time, full of experimentation, a concern with moving beyond the aesthetic of representation, and an insistence on the expression of ideas not merely in the arts but in theoretical and polemical treatises and proclamations. A central figure for this account, not surprisingly, is the aforementioned artist and theorist Kazimir Malevich, the founder of "Suprematism". Malevich was part of the collaborative team that produced the absurdist opera Victory over the Sun (1913). It was for this production that he created Black Square, a mere black square drawn on a calico curtain. This work furthered Malevich along the path toward what he termed nonobjectivity. The square is not really an object in the truest sense. We often encounter various types of cubes in the world, and sometimes even square, flat objects. But the square itself is an idealized entity. Along with the circle and other simple, abstract shapes, the square invites the viewer into a realm removed from the intimations of space and time; it evokes a purity that cannot be adequately experienced, only projected or imagined. Alongside these early suprematist works, Malevich created "alogical" works such as Cow and Violin (ca. 1913-1915). Clearly modeled after Cubist technique, this drawing presents a Cubist background but does nothing to obscure the alogical juxtaposition of its two main figures, the cow and violin of the title. Although I'm not accustomed to thinking of Malevich as having much of a sense of humor, the effect here is certainly amusing. The violin, a favorite Cubist subject in the hands of Pablo Picasso and George Braque, a symbol of sophistication and refinement, is here brought down to earth by being superimposed by the basic outline of a steer. At the same time, Malevich evinces a seriousness of intent with the inscription included below the picture: "Logic has always placed an obstacle before the new subconscious movements and, in order to free itself from prejudices, the course of alogism was advanced. The drawing shown above represents a moment of struggle." This is one distinction between at least Malevich's approach to art and the characteristic Dada attitude as exemplified by Marcel Duchamp. The silliness in Malevich is ultimately intended to be deathly serious. Moreover, in contradistinction to Duchamp's expressed apoliticism, Malevich and many of his Russian colleagues see their work as contributing to the advancement of the social nature of humanity; by freeing themselves from prejudices, they were preparing a renewal of the body politic. Indeed, in the post-revolutionary, Leninist period, Malevich began to see nonobjectivity as the aesthetic embodiment of a new consciousness, a means of connecting with the proletariat without pandering to them. Works employing his geometric language began to appear in public spaces. This proliferation of his aesthetic was described as a kind of anti-art, a way of moving past the aesthetic distinction of the past (reserved for the wealthy and educated) and raising a new and modern mode of aesthetic thought. 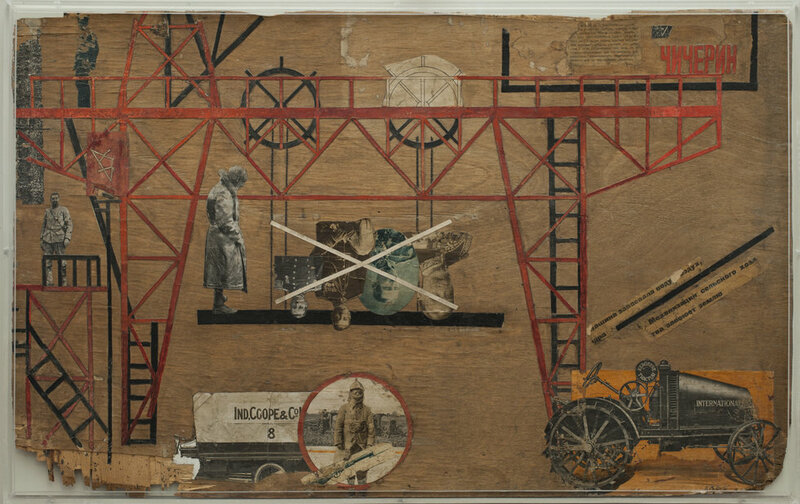 But while it shared a kind of anti-art agenda with the more familiar forms of Dada, it distinguished itself through its revolutionary agenda—in a country that was still seeking a foundation for its communist experiment. This is a significant difference. While what we are used to thinking of as Dada was revolutionary in the sense that it attempts to move away from accepted norms regarding art, Russian Dada (that is, all the various schools of thought that might be somewhat uncomfortably situated under that name) sought to support an actual revolution in progress. In this sense, Russian Dada was not anti-establishment, but rather attempted to buttress the erection of a new manner of governance. While Margarita Tupitsyn's substantial essay takes up roughly half the space of the book, the remaining three essays are more modest in their length and scope. Victor Tupitsyn's "Dada in Cyrillic" comprises a series of vignettes on Russian art of the period, the transrationalism and "shiftology" (never very well defined) of Aleksei Kruchenykh, the gathering place at the Fantastic Pub for artists in Tiflis, the Nothingists, and the impact of Russian Dada in Paris. The essay suffers a bit from overreach in that Tupitsyn attempts to draw connections to many disparate (and perhaps not apposite) schools of thought and philosophy—including a relatively thin connection to Jean-Paul Sartre, fleeting references to Martin Heidegger and Siegmund Freud, and an unconvincing use of Gilles Delueze and Felix Guattari's concept of the rhizome. Given the limitations of space, none of these connections are explored in the depth required to make them convincing. Natasha Kurchanova's "Humor as Parody, Eccentrism, and Satire in Soviet Film after World War I" has more modest ambitions and largely succeeds in achieving them. Her main concern is the comedic films of the post-war period and their use of montage. Perhaps her most compelling contribution is the manner in which she re-evaluates Eisenstein's approach to montage and the debts he owes in his heroic films to the work he and others did in more humorous early forms. Olga Burenina-Petrova's contribution, "Anarchism and the Russian Artistic Avant-Garde," explores the connections between anarchism—both as a political value and a bid for aesthetic freedom—and the artists under consideration. As she points out, Malevich's Black Square is also "an embodiment of the image of the black banner, the anarchists' main emblem" (239). Russian art of the early 20th century is too often relegated to the sidelines. This was an important period of innovation in that country. Moreover, this period in Russian art provides a fascinating insight into the way in which art and politics intertwine in a far more tumultuous and effective manner than the typical examination of their relationship. Russian Dada provides a useful introduction to this under-examined moment in art history.